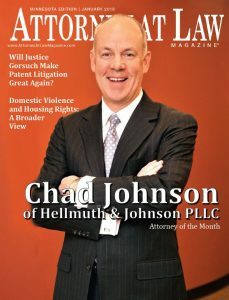 Chad Johnson, Hellmuth & Johnson’s co-founder and managing partner, appeared in the January 2018 edition of Attorney at Law Magazine. That approach paid off. Hellmuth & Johnson has risen to become a top 20 Minnesota law firm since it was started in 1994. The full article is available on the Attorney at Law Magazine website and as a downloadable PDF. In addition to serving as Hellmuth & Johnson’s managing partner, Johnson represents a broad range of businesses, corporations, limited liability entities and individuals in pursuit of their business, real estate and transaction goals.